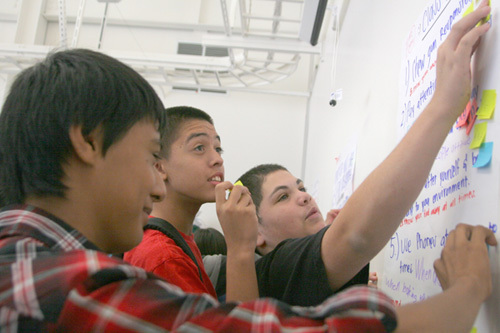 When Montebello’s new $30 million, career-oriented high school opened its doors to more than 250 freshmen earlier this month, students were quickly told to shed their habit of waiting for teachers to tell them what to do. For one, there are no bells to signal the beginning and end of a class or rest period – students must keep an eye on the clock and be ready for class at the scheduled time. In each classroom, students are also organized into groups and expected to give regular presentations to the entire class. Not only are students expected to be able to answer this question confidently, they must also get used to addressing teachers and school administrators less as authority figures, and more as equals, Luckeroth-Lockhart says. The school is organized around the idea of “project-based” learning, which involves a small amount of traditional teacher instruction and getting students to learn academic material in a group setting. It is the only school of its kind in the Montebello Unified School District, and represents a growing trend of schools seeking new ways to more directly engage students in their learning, in hopes of improving academic outcomes in a variety of areas beyond just test scores. Students are expected to do well academically, but the school’s goal is to make sure when they graduate from high school and college, they also have a good understanding of how the professional world works, Luckeroth-Lockhart said. At Applied Tech, when students are presented with their “project” assignments, they must first figure out what information they already know, and then determine what more they need to learn or research in order to complete the task at hand, according to teachers at the school. In addition to getting graded on traditional academic subjects, the students will be evaluated according to seven additional grades that reflect their level of work ethic, ability to collaborate and work in a team, critical thinking skills, oral and written communication skills, and numeracy, the ability to use math and numbers in practical settings. All skills that are valuable on the job, Luckeroth-Lockhart said. According to Luckeroth-Lockhart, the Applied Technology Center is one of 70 schools across the nation using the teaching method developed by the New Tech Network, a nonprofit with roots in the Silicon Valley boom. The nonprofit came into existence when a Napa, Calif. tech industry employer decided they were not able to find people they could hire straight out of school who could “jump right in and be problem solvers, and help us create,” Luckeroth-Lockhart said. Most of their day is consumed with academic subjects, with one elective in their chosen area of professional study, such as engineering, construction, healthcare, hospitality, or law and government services. Each student gets to pick a first choice and second choice career to focus on in the next four years. Livan Valdivia, 14, said he chose law because he has a general interest in it, and because his brother had a bad experience with a lawyer who was working on his car accident case. “Books bore me,” says 14-year old Felisa Duran, who wants to become a psychologist. So far she has not been bored at the Applied Technology Center where most coursework is done on the computer or in a social setting, she says. Irais Herrera, 14, wants to become a famous architect and cites the influence of her elder sibling who encouraged her to take advantage of a “once in a lifetime” opportunity to attend a high school with a “college-like” atmosphere. At full capacity, the school will have 720 students. 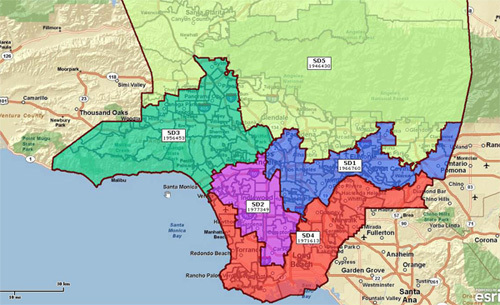 The Los Angeles County Board of Supervisors voted 4-1 Tuesday to approve a redistricting plan that leaves boundaries largely unchanged and does not create a second Latino-majority district. Supervisor Gloria Molina was the sole vote against the plan recommended by the county’s Boundary Review Committee, also called A3. County approved amended A3 district maps that will essentially remain as pictured above. Both Molina and Supervisor Mark Ridley-Thomas had submitted alternative proposals, each of which would create a second, Latino-majority district in the county. But Ridley-Thomas ultimately voted to support the BRC’s plan after the two alternatives were defeated. If the board had been unable to muster the four votes needed to approve any of the plans, the decision, by law, would have been made by a committee comprised of District Attorney Steve Cooley, County Assessor John Noguez and Sheriff Lee Baca. Ridley-Thomas and his colleagues wanted to avoid that. That was one reason he voted with his colleagues to approve A3. “Rather than put (redistricting) into an untested, uncertain, potentially quite partisan arena,” he said, “it’s better to put it in a much more appropriate place, the courts,” which is where Ridley-Thomas said he believed the matter would ultimately be decided. On that issue, he and Molina seem to agree. As Molina made the case for her alternative redistricting map, she referred repeatedly to Garza vs. the County of Los Angeles, which generated a 1990 ruling that the Latino community had been denied an equal opportunity to participate in the political process and forced the county to redraw its district boundaries. Those maps resulted in Molina’s election as the board’s first Latina representative. On Tuesday, she insisted the board had an “obligation” to create a second Latino-majority district in Los Angeles County to comply with the federal Voting Rights Act. An estimated 1,300 Angelenos turned out to the meeting and more than 900 signed up to speak. The county is required to redraw boundaries once every 10 years to reflect U.S. Census data. The 2010 federal count showed that Latinos make up 48 percent of the county population, up from 45 percent in 2000, and more than a third of the county’s potential voters. Many from the Latino community argued that the A3 map maintains a status quo that disenfranchises them as voters. They recalled a time, before the Voting Rights Act led to more Latino elected officials, when many of their needs—for health care, transportation and public safety—went unmet. But opponents to a second Latino-majority district argued that race should not be the basis for drawing districts and that Molina and Ridley-Thomas’ proposals would destroy other important communities of interest and relationships that have been cultivated over many years. Sen. Fran Pavley, D-Agoura Hills, and Assemblywoman Julia Brownley, D-Santa Monica. both spoke today in favor of the Boundary Review Committee’s proposal, A-3, in order to maintain important constituencies that, for example, protect the Santa Monica Mountains. Others have argued that creating a second Latino district amounts to gerrymandering on the basis of race. But Assemblyman Tony Mendoza, D-Artesia, disagreed. “It isn’t about race, it’s about fair representation in Los Angeles County,” he said. Councilman Eric Garcetti, who is running to replace Mayor Antonio Villaraigosa, echoed that sentiment. Lawsuits have been threatened by both sides and Molina seemed to be preparing for that eventuality Tuesday, inviting law professors and activists to provide what she characterized as “expert testimony” on the Voting Rights Act. Matt Barreto, associate professor of political science at the Univ. of Washington, argued that a review of election data shows that Latino and non-Latino voters are polarized in their voting habits. That assertion is key to determining whether the Voting Rights Act would require a second Latino-majority district. It is a point that Molina emphasized during a presentation she made following the public testimony. She cited analysis of 27 recent elections that showed that, on average, 71 percent of Latinos voted together for Latino candidates, while 70 percent of non-Latinos voted against those same candidates. The county’s newly approved plan “ensures that Latinos will consistently be unable to elect a candidate of their choice,” she said. But Laura Brill of Kendall, Brill and Kleiger, hired by the county to analyze the redistricting issue, disagreed with that interpretation. She has previously said that the “Voting Rights Act does not create a right to control election outcomes in a particular district.” She has also indicated that election data is subject to differing interpretations and that the choice of particular elections may be critical to the legal analysis. There was some last minute drama in the board’s decision. All three plans were first voted down. Then the supervisors moved into a short closed-door session to clarify some legal issues. On their return, Antonovich proposed an amendment to the A3 plan which moved some boundaries to keep Hawthorne, Pico-Riviera and Azusa intact in a single district and make some other minor modifications. Antonovich, Molina and Ridley-Thomas all agreed the changes were intended to clean up small anomalies and not the reason for Ridley-Thomas’ changed vote. “Regrettably … we find ourselves in a circumstance where a federal court will likely determine whether a second (Latino-majority) district is required,” said Ridley-Thomas. Following the meeting, Supervisor Zev Yaroslavsky said he believed that the Fourth District as drawn under the approved map would be one where Latinos will be able to elect a candidate of their own choosing. Before considering the board’s last-minute amendment, that district would be 43.3 percent Latino, according to an analysis by the county’s Chief Executive Office. But Molina held her ground, saying the new Fourth District would not constitute what was characterized as a “Latino-opportunity” district. The Bell Gardens City Council on Monday unanimously approved a motion to allow the city’s redlight traffic camera contract to expire and to send a letter opposing the local water company‘s proposal to increase water rates. Councilmember Pedro Aceituno motioned that the contract with RedFlex Traffic Systems, Inc. not be renewed after city staff reported the traffic cameras had not significantly affected the number of injury accidents at the intersection of Florence and Eastern Avenues, and the police department said there were unanticipated personnel costs to manage the system. The temperature in the council chambers quickly escalated when Mayor Jennifer Rodriguez beat Councilman Daniel Crespo’s attempt to second Aceituno‘s motion. Crespo, a long time critic of the cost of tickets generated by the system, accused Rodriguez of trying to take credit for ending the traffic camera program and using it for political gain. Crespo’s charge sparked a nearly 10 minute long shouting match that included the mayor pounding her gavel several times as she repeatedly told Crespo he could speak when she was done making her point. Rodriguez said she and her fellow councilmembers origianlly made the difficult decision to approve the red light camera contract with the safety of residents in mind. She accused Crespo of being a politician who abstains on difficult votes to avoid controversy and responsibility for decisions made by the council. Rodriguez also accused Crespo of influencing her challengers in the upcoming Nov. 8 election, when she and Aceituno are up for reelection. Holding up a campaign mailer from her challengers, she said they are spreading “lies” manufactured by Crespo and telling voters they can lower residents‘ utility bills and provide housing for seniors when they cannot. The loud rambling also included controversies raised during past election campaigns. “You use people” and exploit their vulnerablilities, Rodriguez told Crespo. “These ladies who are going door-to-door are offending the intelligence of our community,” Rodriguez said. While the name calling and accusations continued, other city councilmembers and city staff sat quietly and uncomfortably. Mayor Pro Tem Sergio Infanzon burried his face in his hands during the tirade. At no point did the city attorney attempt to stop Rodriguez and return the meeting back to the agenda, though he did attempt to signal Crespo to hold his comments. Both Rodriguez and Crespo brought up decade-old sore points during the shouting match. She accused him of being part of a stagnant city council in the 1990s, and he accused her of causing the death of a cancer-stricken city employee whose hours and benefits were reduced with her backing. When Crespo was finally allowed to speak, he did so calmly, but he did not attempt to stand up for the city council challengers who are reportedly his friends but were not at Monday’s meeting. He asked staff to clarify whether the city was benefiting from the red light cameras, and why the price of a ticket was never posted. He asked how the red light cameras were similar to the cameras in the City of Los Angeles. “This is a good decision for the community, I’m happy we discontinued it,” he said. Following the meeting, however, Crespo continued to say the timing of the decision to scrap the contract was politically motivated, since it was not scheduled to expire until March 2012: the election is about a month away. At the end of the meeting, Rodriguez apologized for getting “emotional,” but still added that the community sees right through the political manuverings of Crespo and her opponents. With order restored, the council moved on to other business and approved sending an official protest letter to the California Public Utitilites Comission (CPUC) over Golden State Water Company’s proposed three year rate increase. The increase would affect 70 percent of the city’s water lines. Bell Gardens water system is divided and owned by two potable water systems. Bell Gardens owns 30 percent of the city’s water system, while Golden State Water Company (GSWC), a subsidiary of American State Utility Services, Inc., owns and services the remaining 70 percent of the city’s water system. The Golden State Water Company has submitted a request to the CPUC—the body that oversees and sets utility rates—soliciting permision to increase their residential water usage cost by 20 percent in 2013; 2.8 percent in 2014 and another 3.3 percent in 2015. The increase would mean a monthly household water bill of $51.34 would increase to $65.47 over the three year span. The water company says the rate increase is needed to cover increased water rates, pumping costs and needed infrastructure and capital improvements. The rate increase, if approved by the Commission, could take effect in January 2013 and would also apply the company’s metropolitan “Region 2“ area that includes portions of Bell, Unincorporated Los Angeles (Florence, Willowbrook), South Gate, Cudahy, Huntington Park, Artesia, and Norwalk, according to Golden State Water Company’s Central District Manager Katherine Nutting. Bell Gardens resident and former city council candidate Cristina Garcia congratulated the council for approving the protest letter and suggested they use their power to urge legislators to push for a moratorium and an audit of Golden State Water Company’s expenses, and place a moratorium on other increases. Immigrant laborers want their rightful place in history recognized at the Mexican cultural epicenter of Los Angeles. They have begun a campaign to erect a 6-foot tall statue of a bracero laborer at El Pueblo Historical Monument, better known as Olvera Street. Organizers are now trying to raise the money and copper needed to complete the project. People can donate old keys, pennies and other unwanted items made of copper to their effort. “The statue will have a short-handled hoe in one hand and a [bunch of] broccoli or [head of] lettuce in the other,” the president of Binational Union of Ex-Braceros, Baldomero Capiz, told EGP on Monday. Braceros, or immigrant laborers, played an important role in building Los Angeles and the local economy, including as guest workers that met the U.S.’s need for outside labor during the war years of the last century. They are part of the local history, say supporters of the effort to build the new memorial. 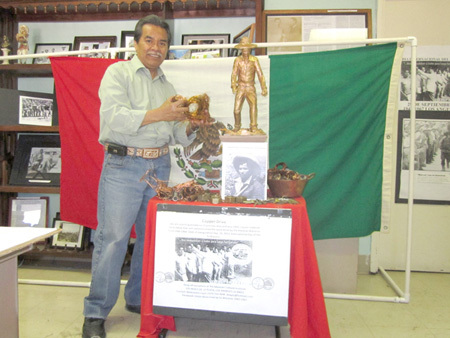 The braceros and their supporters in Los Angeles began their copper fundraising efforts for the statue earlier this year. They conservatively estimate they need $35,000 for the statue and it’s installation. The design vision and two pre-fabrications have been completed, now they need the materials to make the statue stand tall, Capiz said. But they also need to cut through some red tape at City Hall to get the necessary permits approved so it can be installed, he said. Capiz said Los Angeles City Councilman Jose Huizar (CD-14), who represents the area, is involved in the statue’s planning and will ask for the council’s support at Friday’s council meeting. Huizar’s father, Simon Huizar Banuelos, and uncles were braceros. Huizar’s long-time support includes helping the Union Binacional secure a space for their photo exhibit at the Mexican Cultural Institute and on First Street in Boyle Heights, which many people were able to visit during our Eastside Gold Line Extension celebration, according to Huizar’s spokesperson Rick Coca. “He is supportive of this latest effort to bring attention to an important part of our history that has been swept under the rug for too long,” Coca added. Last year, the City Council approved Huizar’s motion to declare Sept. 29 as the “Day of the Bracero” in Los Angeles. A similar event will take place Friday, according to Capiz. This will be the 4th annual “Day of the Bracero,” an honor they hope can will one day be a state holiday, he added. The Bracero Program, which lasted from 1942 to 1967, was a guest worker labor arrangement between the US and the Mexican government. According to historians, as US allies during World War II, Mexican braceros filled labor shortages in the country’s agricultural fields and constructing US railroads. The braceros toiled the land and harvested the crops that sustained the country and the soldiers abroad, Capiz told EGP. Many of the now elderly, and in many cases impoverished, former migrant workers have a strained relationship with the Mexican government. The dispute is over a 10-percent deduction taken from their pay and handed to the Mexican government that was supposed to be returned to them, but was not refunded as agreed. In 2001, a group of braceros won a class action lawsuit that made some of them eligible for a $3,000 payment from the Mexican government, but it only applied to braceros who worked from 1942 to 1946, according to Capiz. Of the 4.5 million braceros Capiz says are eligible, as of today only about 80,000 on both sides of the border have received their compensation. Capiz says Mexico does not want to pay the damages awarded and is contesting the number of workers eligible for compensation. “The Mexican government doesn’t want to recognize the plight of the bracero,” Capiz said, speaking in Spanish. There are a total of 194,002 Ex-Braceros who were/are eligible for benefits and met documentation requirements, according to Mireya Magaña Galvez, a spokesperson for the Mexican Consulate-General in Los Angeles. Documentation requirements were very strict—workers were not allowed to use their US Social Security documentation as proof—and there were irregularities and typos that disqualified many of the braceros, according to Capiz. 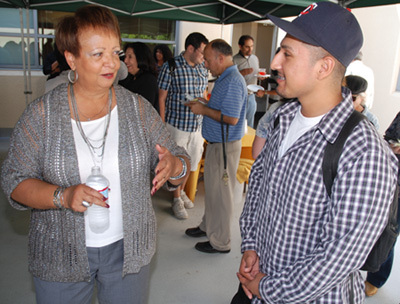 On Sept. 12, the Mexican Consulate in Los Angeles began issuing checks to the former laborers. A total of 1,111 checks will be issued in L.A. and 890 have already been turned over, Magaña Galvez told EGP. Strained ties resurfaced last week when Mexican President Felipe Calderon was in town and members of the Binational Union of Ex-Braceros were left out of the president’s event. Capiz alleges they were denied the opportunity to register and receive clearance to attend the event. He is calling it discrimination. However, Magaña Galvez says the men were not discriminated against and were invited to register to attend a week in advance. Capiz disagrees. While the Union Binacional de Ex-Braceros is associated with the Mexican Cultural Institute (MCI) located at Olvera Street, they are not affiliated with El Pueblo de Los Angeles Historical Monument, according to El Pueblo Public Relations Director John Kopczynski. Braceros are “a cornerstone of modern day immigration of Mexicanos to US,” said Vasquez-Ramos, a professor at California State University, Long Beach. His own family migrated to the US in 1961 to join his father and uncles who were braceros, he said. On Sunday, from noon to 4pm, the Day of the Bracero will be celebrated at Olvera Street, Capiz said. Pedro Rivera, father of singer and reality show star Jenny Rivera and a former bracero , will be at the family friendly event, he said. The Mexican Cultural Institute will also screen “Cosecha Amarga (Bittersweet Harvest),” a documentary on the braceros’ struggles. It may seem like a petty complaint we’re making, but a clean community makes for a better quality of life in an urban area. Our complaint is that week after week we observe how property owners and renters continually dump broken furniture, assorted bags of trash and clothes, mattresses and obsolete televisions on the sidewalks of Los Angeles, but don’t bother to call 311 to have these items picked up. These discards not only pose a health problem, but also can cause accidents to pedestrians and cars trying to maneuver their way through the minefields of people’s castoffs. We know the city will say they have no money for such an undertaking, but we think the city should every three months or so dispatch trash trucks to pick up discards left at the curb by people too lazy to dial 311— the city’s number to report trash and bulky items needed to be picked up or graffiti removed, as well as Los Angeles’ call center where you can (if someone picks up) get contact information for a variety of other city services and departments. A short drive down North Figueroa in Highland Park this week, for example, would have documented dozens of discards on the public right of way that would not be there if someone had just bothered to dial 311 and arrange for a pick up. Clean streets and curbs we believe encourage residents to clean up their own acts, and make our neighborhoods the pleasant places where most of us want to live. President and Congress Courting Votes with Untruths? “We need to fight to ensure that the Dream Act is passed,” says the president at the Congressional Hispanic Caucus Institute’s (CHCI) 2011 Annual Gala in Washington DC. Meanwhile Congressmembers Baca, Becerra, Calderon, Chu, Grijalva, Napolitano, and Roybal-Allard sat in the CHCI audience perapetuating the untruth, through an unwillingness to set the record straight. Not only did they refuse to take ownership of the Dream Act’s failure, they joined thousands in applauding this carnival game of untruth. And there we follow, with great hope and aspiration that this president and our Congress will “pass” the Dream Act. George Orwell, author of 1984, could not have written a better script. Similarly, Republican presidential candidates make, as key planks in their platforms, untruths relative to taxes, the environment, social security and the president’s stimulus package, which in Governor Rick Perry’s words “has created zero jobs.” The untruths spewed from the ignorance of these candidates are severely damaging. On the issue of the stimulus package, how many jobs would have been lost was it not for the $700 billion in the president’s ARRA program? How many more millions of Americans would be out of work? Indeed, ARRA has effectively kept millions of Americans in jobs. Scientist after scientist, over 98%, irrefutably concluded human conduct is responsible for global warming. The blood-oath of “no new taxes” the Republican Party has taken, has served as the perfect distraction to the hundreds of billions of dollars being wasted on wars questionably protecting us from imminent danger. The issue today is not so much about new taxes, or less taxes, but rather why over half the taxes we currently pay are going to support wars for which there is no attainable objective. Meanwhile, the much more severe and imminent threat is poverty, lack of jobs, and lack of investment in education – our future economy. These threats here in our homeland are real and must be dealt with swiftly and appropriately. The virtual annihilation of the middle-class and increased poverty among millions of Americans easily trumps the threat of a desert terrorist solider, whom our president and congressional leaders say we must be protected from at all cost, even if it means losing your home, your job and most of your basic rights. Of course one party will continue to blame the other and visa versa. Staunch Obama supporters will say, “You certainly don’t want a Republican president because then it will really get bad.” To my esteemed colleagues, it already is! A recent poll showed that California voters gave Congress a 9% approval rating. It is time for a third rail. Picking the lesser of two evils, the lesser of the two do-nothings, in this climate, will once again leave us with nothing. America is a great country, and we Americans are great people. Settling, albeit the order of the day for now, is not what America does. We know in our hearts we can and must do better. I live nine blocks from the U.S. Capitol, so many of my neighbors depend on the government for their livelihoods. A few — a scientist, an editor, a Secret Service agent — belong to that often mocked and rapidly shrinking category known as “civil servants.” The government writes their paychecks, lets them buy into a decent health insurance plan, and runs a respectable pension system for them. Some belong to — and are protected by — powerful unions. Their generous benefit packages and job security are the stuff of legend. It’s not surprising that eliminating their jobs and chipping away at their benefits have become favored tools of budget-conscious politicians in recent months. Last November, President Barack Obama froze federal wages for a full two years in an effort to build his credibility as a budget hawk. But even that wasn’t enough for some members of Congress. They’re advocating that the Super Congress, those dozen lawmakers who are tasked with carving at least $1.2 trillion from the federal deficit, cut that fat federal workforce and outsource more jobs to private industry. On average, Uncle Sam spends nearly twice as much when the government outsources a job as it would if it just hired another “expensive” federal worker, says a new report by the Project On Government Oversight, Bad Business: Billions of Taxpayer Dollars Wasted on Hiring Contractors. In researching this report, the POGO assessed contracts in 35 different job categories, comparing the total compensation for a federal employee with contractor annual billing rates to provide the same services. Astonishingly, in 33 of the categories, the federal employee cost the Treasury significantly less than the contractor. Consider this example. For a “general attorney” on the public payroll, the government spends about $175,000 a year on salary and full benefits. If, however, the government hires a contractor to provide the same legal services, POGO found that we taxpayers would dole out almost $555,000 a year. Comparable findings surfaced in lots of other cases. Accountants on the public payroll cost us about $124,000 a year. If we engage them through a contractor, we spend about $283,000. Federal food inspectors carry a $58,000 yearly price tag as government employees, but cost about $75,000 if they’re hired through a contractor. How can this be? For two decades, the White House and Congress have sought to privatize more and more government jobs. This was supposed to save lots of taxpayer dollars. The logic seemed impeccable: Break the government monopoly and free-market competition would drive down the cost. So the feds embraced outsourcing and invited bids from all comers. What went wrong? One of the biggest problems was that the government simply assumed that contracting would truly save money, and didn’t bother to verify whether that actually happened. This might explain the dramatic increase in federal service contract spending to more than $320 billion each year, which hasn’t reduced the overall size of the federal workforce. Studies that found civil servants to be better-paid than their private-sector counterparts supposedly justified the contracting bonanza. But those studies compare apples to oranges. If Washington is serious about cutting wasteful government spending, it has to factor in what a contractor bills. After all, taxpayers foot the bill for the contracting company’s profits and its administrative costs, not just their employees, who are doing work that would otherwise be handled by civil servants or members of the military. There’s a simple solution. Congress should institute safeguards to ensure that taxpayers stop wasting billions of dollars on bloated contracts. The government just has to determine that the overall, real cost of every contracted hire is compared with the overall, real cost of hiring a public servant. This is a move that belongs on the agenda for the Super Congress. It’s a no-brainer.